A female high school student had immediate plans to bomb her school in Frederick County, Maryland, and shoot students and teachers, police say. Nichole Cevario, 18, stockpiled bomb-making materials and had a shotgun to attack Catoctin High School on April 5, the Frederick County Sheriff's Office said Monday. She wrote about her plans in detail in a diary her father found. Police believe the diary entries were not empty threats, Sheriff Charles A. Jenkins said at a news conference. Cevario "had the means and equipment to have caused a significant life safety event” at the school, police said in a statement. Police learned of Cevario's plot after her father read her diary and called the school. Within hours, the honor student was pulled out of a classroom and involuntarily taken to a hospital for a psychological evaluation. Police searched Cevario's home in Thurmont, Maryland, and found weapons and the diary. In the home, police say they found a 12-gauge shotgun with ammunition and bomb-making materials including pipes with end caps, shrapnel, fireworks, magnesium tape and fuse material. The gun and other items were purchased legally, police said. In the diary, police say Cevario "spelled out a detailed shooting event that she planned to execute on a specific date in April," police said. Officials later said that date was April 5. It was not immediately clear whether that date had any significance. The diary showed the high schooler, who had been taking college classes in criminal justice, had been planning the attack for some time, police said. She compiled information on the school's emergency procedures and the school resource deputy on duty. Officials say Cevario acted alone and never took a weapon or explosive device to the school. It was clear she had mental health issues, the sheriff's office said. "Obviously, this was a student who needed some intervention and some help, and I think the silver lining is she's going to get the help she needs now," Frederick County Public Schools spokesman Michael Doerrer said. The tip police received from Cevario's father may have saved lives, officials said. "The Sheriff’s Office is extremely appreciative of the parent’s actions in bringing this potentially deadly incident to the proper authority’s attention, promptly, so that a positive conclusion could be achieved," the statement said. The U.S. Bureau of Alcohol, Tobacco and Firearms and the Maryand State Fire Marshal's bomb squad assisted the sheriff's office. The school's principal assured parents that students are secure there. "We keep our school safe, and we will continue to work together as a community to keep it safe," Principal Bernie Quesada said in a letter sent Monday. Counselors were available at the school. Once Cevario is released from the hospital, she will be charged with possession of explosive and incendiary material with intent to create a destructive device. Law enforcement and school officials said they had no sign Cevario had any problem. Anyone with information for police is asked to call 301-600-2583. A shotgun, ammunition and bomb-making materials including nails and fireworks were found at Nichole Cevario's home in Thurmont on Thursday, Frederick County Sheriff Charles Jenkins said at a news conference. There is no evidence that anyone else was involved, Jenkins said. One of the teen's parents notified Catoctin High School officials Thursday of a potential threat of violence and Cevario was removed from the classroom and turned over to investigators, the Frederick County sheriff's office said in a statement. Cevario was later taken from the school to a hospital for an emergency evaluation and remains hospitalized, officials said. Cevario's journal "clearly spelled out" detailed plans for an attack she had been working on for some time, including a timeline of the attack with her expectations for each stage, officials said. She had set April 5 as the day of the attack, the sheriff said. She was acquiring the materials and compiling details about school emergency procedures associated with drills conducted by school staff and on the school resource deputy. Cevario's diary showed "evidence of mental health issues, emotional issues," Jenkins said. There was no indication that bullying was an issue, but the diary showed "a lot of frustration in her personal life," Jenkins said. Investigators don't believe anyone was working with Cevario and they think they've eliminated any threat to the school and community, officials said. While explosive materials were located during the investigation, they weren't combined in any form that created an explosive device. Investigators have obtained an arrest warrant charging Cevario with possession of explosive material with intent to create a destructive device and possession of incendiary material with the intent to create a destructive device. They say the warrants will be served when she is released from the hospital. A man who answered the phone at Cevario's home and her attorney, Alan Winik, declined to comment. FREDERICK COUNTY, Md. — An 18-year-old woman faces felony charges for what investigators called a detailed plot to carry out a mass shooting at her high school. “There is no doubt in our minds that we averted a disaster out there,” said Frederick County Sheriff Charles Jenkins, comparing the possible destruction to the deadly attacks on Columbine High and Sandy Hook Elementary. It was Nichole Cevario’s father who alerted investigators to her plans, which, Jenkins said, were outlined in detail in her diary. Entries dating back to mid-December spell out a timeline and phases of a planned attack on Catoctin High School, in Thurmont, Maryland, set for April 5, he said. Investigators quickly determined Cevario was acting alone and that no weapons or explosives had been on school grounds, said Maj. Tim Clarke, with the sheriff’s department. However, Cevario had been gathering intelligence on emergency procedures at the school during drills and asking questions about the school resource deputy, asking, for example, how deputies were armed when they responded to a school emergency, Jenkins said. “It was all in her preplanning in her mind, how she was going to carry this out. She looked at the patterns of the deputies; she looked at the entrance and exits of the school, how the school was secured,” Jenkins said. Beyond the plans in Cevario’s journal entries, Jenkins told reporters in a news conference Monday it was also clear the teen was suffering from mental health issues. However, Jenkins was unaware of any previous knowledge from the school that the teen was suffering and could not say whether she had a disciplinary record. But when investigators went to her home, they found enough evidence to show “obvious intent was there,” Jenkins said. “The evidence that we got from her home revealed that she was taking steps, active steps, acquiring the materials. 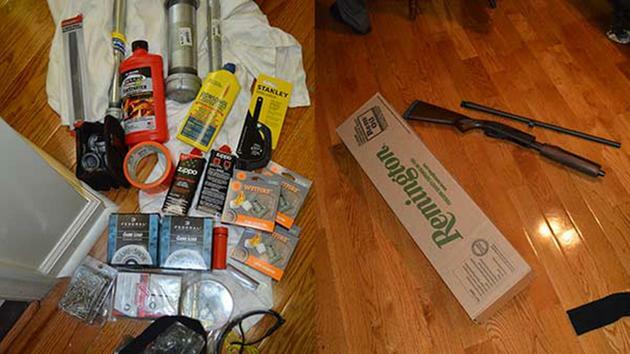 including the purchase of a shotgun, the construction of pipe bombs and other explosives,” he said. As an adult, Cevario legally purchased the firearm as well as ammunition, pipes with end caps, shrapnel, fireworks and fuse material, Jenkins said. Most of the materials were meant for bomb construction, he said; however, no materials had yet been assembled into an explosive. Recognizing Cevario posed a threat to herself, other students and the school community, Jenkins said she was pulled out of class Thursday and committed involuntarily to a hospital for a mental health evaluation. He said that happened shortly after learning from her father there could be a threat, but could not offer a timeline of events. After she is released, Cevario will be arrested and charged with possession of explosive material with intent to create a destructive device and possession of incendiary material with the intent to create a destructive device, Jenkins said. 0 Response to "Police: Teen Planned Shooting, Bombing at Her Maryland High School"